Well, well, well, I’m back in the saddle for another edition of First Dates with Fly! After a long summer of road tripping we finally made it back home to AJ’s on August 27th. I want to thank all the loyal fans that made their way to the rink despite that jerk Irene. 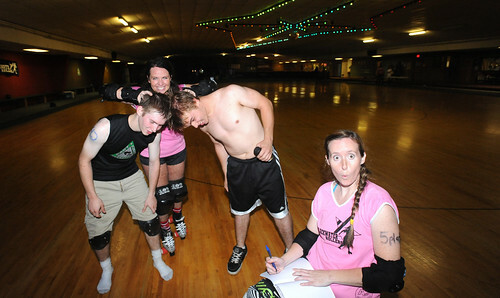 Blackwater suited up against East Coast Devastation, a co-ed team out of Northern Virginia. East Coast may have won but to this young lady more importantly two new skaters were crowned MVP’s. From Blackwater a fan favorite, the one and only Naughty Nini and from East Coast one half of “the Beaver Brothers” Nitro Nate. FLY: How long have you been playing derby? FLY: How did you get started with this sport? NATE: Was reminded of roller derby while watching an episode of Phineas and Ferb but also worked as a floor guard at a roller rink. NINI: My cousin Amy was approached but wasn’t interested in playing so she told me about it. I was looking for a team sport and a way to make some new friends. FLY: Did you play sports before derby? FLY: Are there any skaters you look up to? NINI: Durga from the Richmond Derby Demons because of her great attitude and sportsmanship and my team mate Mighty Mouse for her explosive power. FLY: What do you like to do in your free time? FLY: What’s your favorite dessert? FLY: What song would you be embarrassed for your team to know you secretly like? FLY: Do you have any music that gets you pumped before a bout? NINI: Screaming Deftones lyrics while driving to the bout. FLY: What was your favorite moment from the bout? For all you aspiring MVP’s out there you should take 3 things away from this, run, eat cheesecake, and stop sweating and learn how to glisten. I’ll be back after the 24th of September following our re-match with the Charlottesville Derby Dames.